Creamy cauliflower soup w/bay and smoked bacon–but no cream! 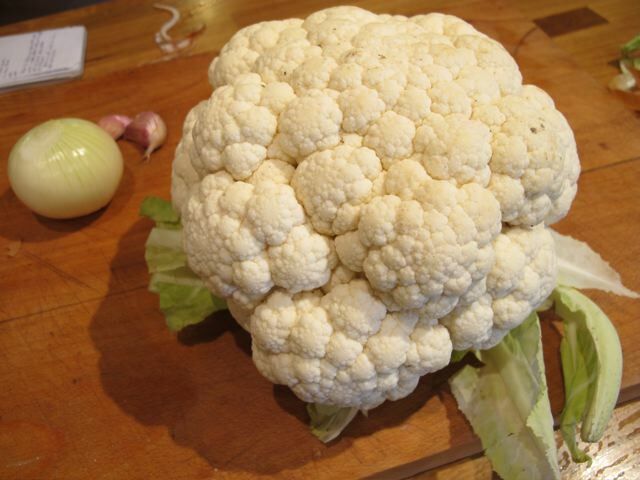 This is pushing it, I know–cauliflowers have been featuring a tad too much lately. “Cauliflower soup,” I said sheepishly. Somehow cauliflower is not a vegetable that’s easy to own! 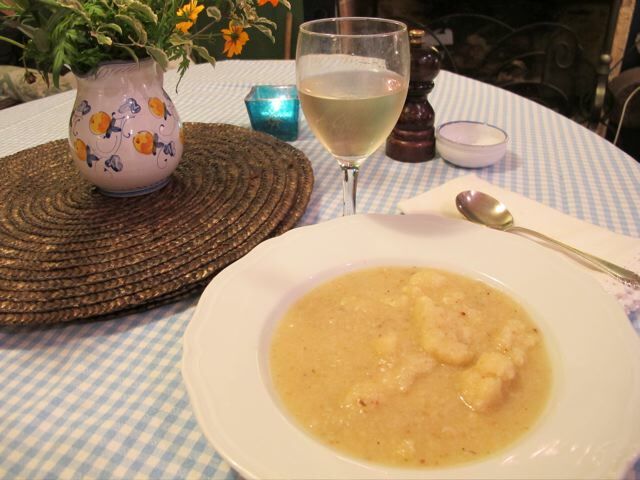 This recipe is adapted from one by Nigel Slater that I spotted in a newspaper last week. Add back the set-aside florets and serve the soup hot. Bacon! I have to try that. I do a similar cauliflower soup but with leeks, not bacon. 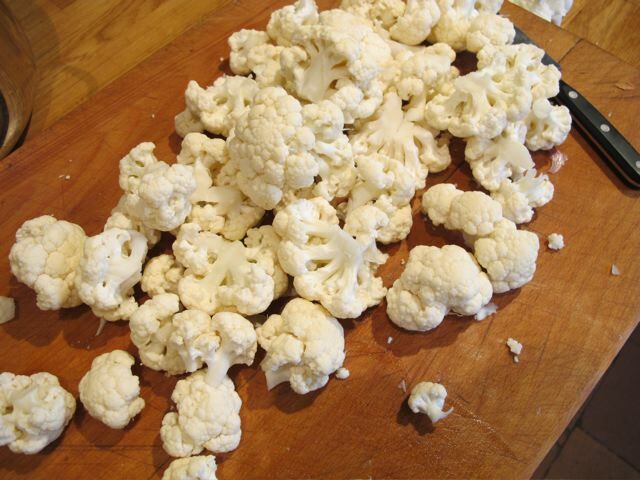 Like Meredith, many folks are surprised by the potatoyness of whipped cauliflower. It is most potatoish when piping hot. I often drop in a dollop of yogurt or cream cheese. Mmmm, I’m heading to the kitchen now. This soup looks delicious! Since I am on a low fat diet I would have to try a little smoke flavoring instead of the bacon, but I bet it would work. 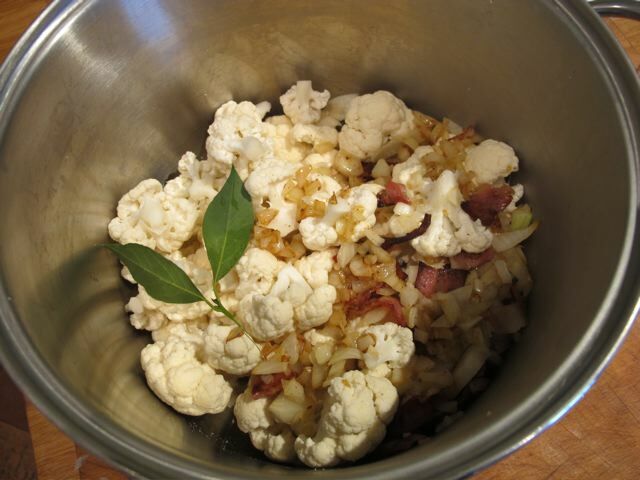 I would never have thought to marry bay leaf with cauliflower but I think I will like it! I received Robin’s cookbook a few weeks ago and it is such a delight. The introductions to the recipes and the illustrations make this cookbook out of the ordinary. Most of the recipes can also be tweaked for low fat diets and I love the variety of dishes. The minestrone is especially delicious:) Thanks for a wonderfully different cookbook, Robin! Thanks, Elizabeth–I’m very happy you are finding it handy. 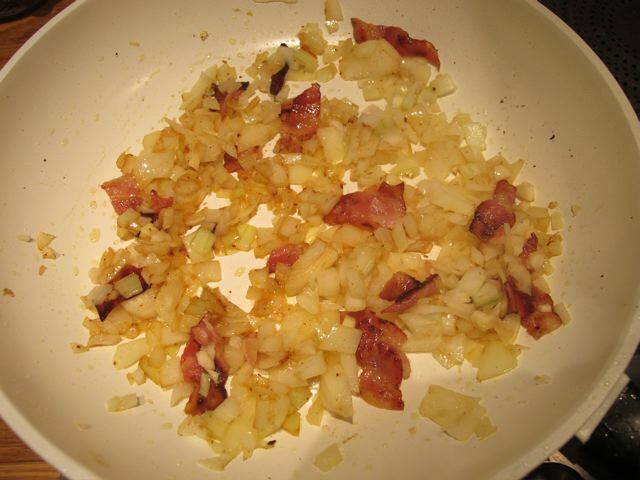 Perhaps you could use really lean bacon; if not Debra–below–suggested leeks. arr well Jimmy and James loss is my gain. Meredith Robin do you still have flowers in bloom for your table? P.S. hope Marmalade is feeling better now and Pippa and Lucian is it? are come round to your little lodger. Marmalade is better and being a dear with the new arrival. This is especially lovely topped with shredded sharp cheddar cheese!